eBay Hack Charger #...idk I lost count. ...which is probably a good thing. This might be a good time to mention that you should not take anything I say about lithium battery chargers seriously...and if you do, you are doing so at your own risk. I highly recommend buying a name-brand off-the-shelf charger and using it according to the manufacturer's instructions. Frankly, though, my habit of going on eBay, buying the most absurd power supply I can find, and making a battery charger out of it is mostly just unfounded EVT urban legend. 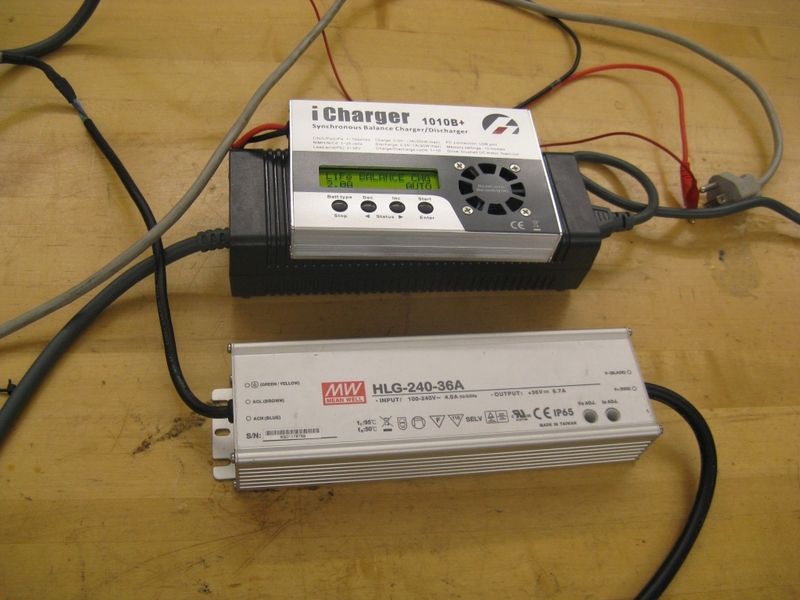 But I do take pride in the Cell Abuser, pictured above, which is essentially a 4V/250A power supply I bought for $100. And yes, it is attached directly to an A123 26650 cell with copper blocks and a quick-clamp. It's as close to the 8.02 ideal voltage source as you can get. The result was about as unexciting as you can imagine: the cell charged from 0 to 80% SOC in 102 seconds and to 94% SOC in 3 minutes. At the end it was...warm. That CV-only charger was just to prove a point, though. For actual day-to-day charging of the LiFePO4 packs I use a sophisticated BMS and integrated charging system re-purposed LED power supply. The MeanWell PLC-100 and the HLG-240 lines actually make very capable 100W and 240W (respectively) CC/CV battery chargers, as I've expounded on in the past. 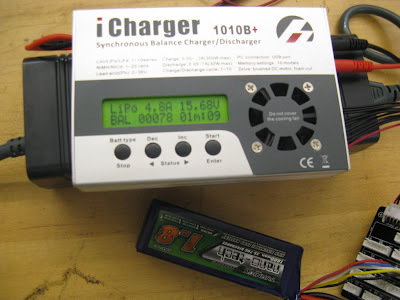 I've been using the HLG-240-36A as BWD and Pneu Scooter's dedicated fast-charger for a long time now. Okay shut up I finally bought one of these. 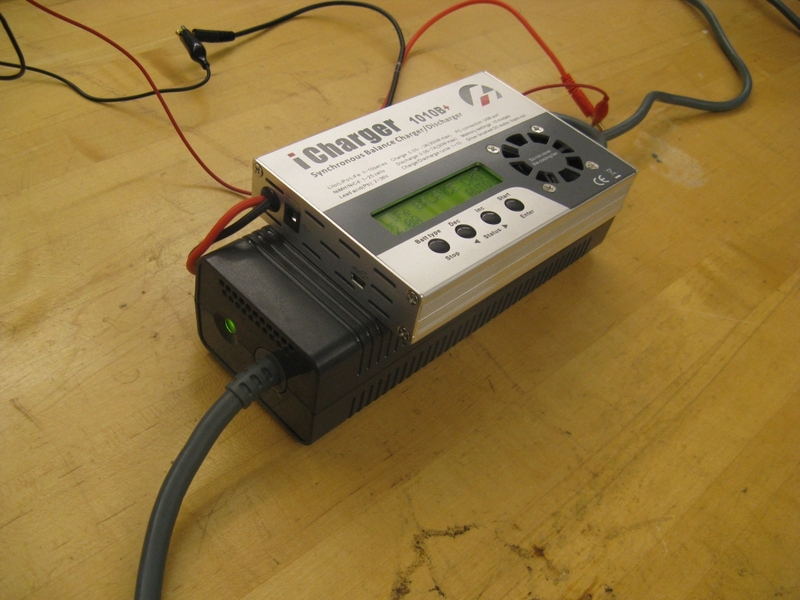 Yes, I agree, it's sometimes more useful to have a charger that can handle any pack voltage and can also balance the cells at the end of a charge. For Pneu Scooter, I use separate battery balancers every...well pretty much never; it just stays balanced because A123 cells are so good. But a balance charger would come in handy when first assembling and balancing a pack. 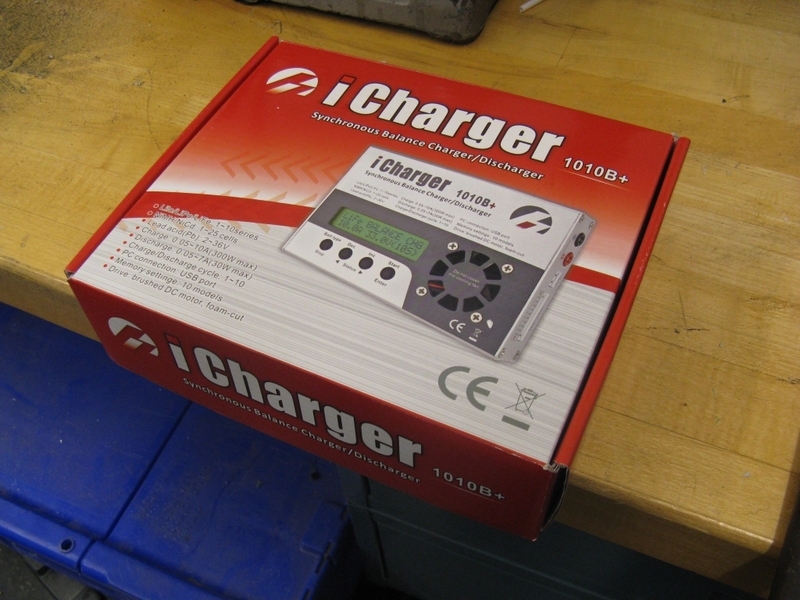 So I finally caved and bought a 1010B charger while they were in stock. Oh wait, there totally are. Thanks to Sasha for the tip. 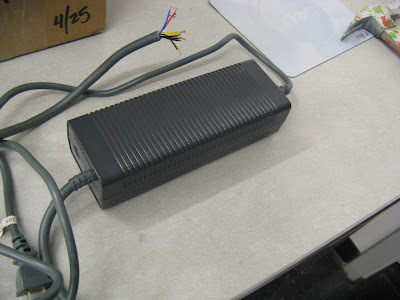 This stupid thing is an obsolete Xbox 360 power supply brick. And it literally is the size of a brick, if not a little bigger. Only Microsoft needs an entire support page dedicated to a wall adapter. Apparently, it's obsolete because it's the old 203W model (12V/16.5A), but since I'm looking for high current anyway it's perfect. They're available on eBay for basically the cost of shipping. I bought a whole box of them for $60 with free shipping. It's still a little bulky. If I were truly going for ultra-compactness and I had an infinite amount of money to spend, I'd get a shiny 300W TDK Lambda supply or something similar. But for basically free, this is not bad. It's better than lugging around a giant closed-frame power supply. Now, does it work? Seems to handle a 5A charge (into a 1.8Ah LiPo) just fine. I let it run until the alligator clips started to smell funny. The 1010B/Xbox Frankenstein charger has the clear advantage of being able to handle any pack size and it can do balance charging. 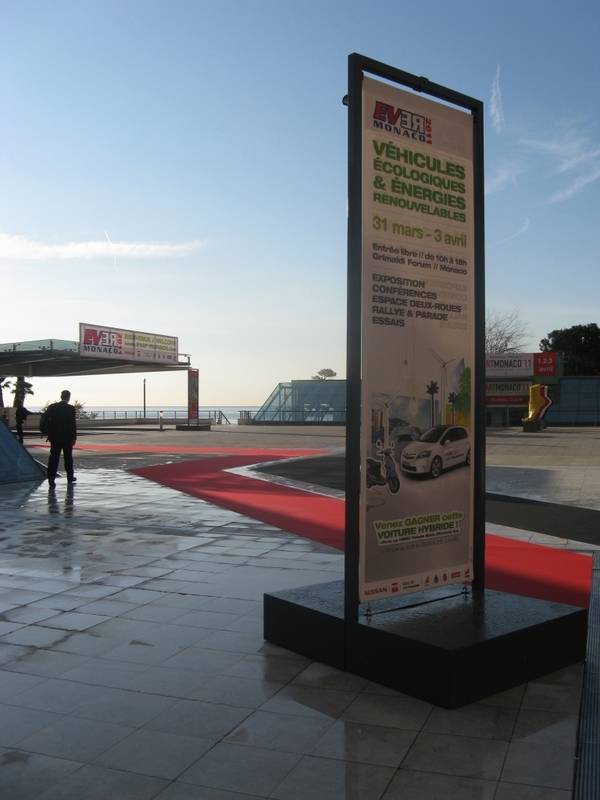 But the MeanWell LED sign supply still wins on size, price, robustness, and power. 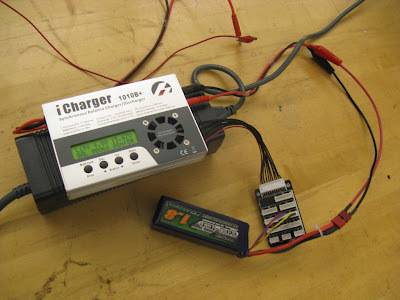 Verdict: I'll stick with the MeanWell for dedicated vehicle charging, but the 1010B rig will be useful for small robot packs, which vary more in size and charge current rating. Anyway, whenever it is that I am able to get back to doing real things, I've set a new target on sensorless field-oriented control. The interpolated Hall effect sensor FOC I use now works great, even at low speed, the sensor costs $3 to implement, it's mostly reliable, and it's easy to fix. So of course it's my job now to make it twitchy and unreliable, especially at low speeds, and to eat the $3 cost savings by improving the current sensors. One way is just to buy a sensorless controller. Besides being a cop out, sensorless controllers like the one above are designed for voltage-controlled RC airplane duty. They use block commutation - driving two phases and measuring EMF on the third to determine rotor position. So, no field-oriented control, no sine waves, no current limting, and only crude start-up routines. Despite all that, a large enough RC plane ESC can sometimes be made to work well for small vehicles. Rotor position estimators that measure asymmetric rotor inductance using test pulses or high frequency injection. These have the advantage of working even at zero speed. 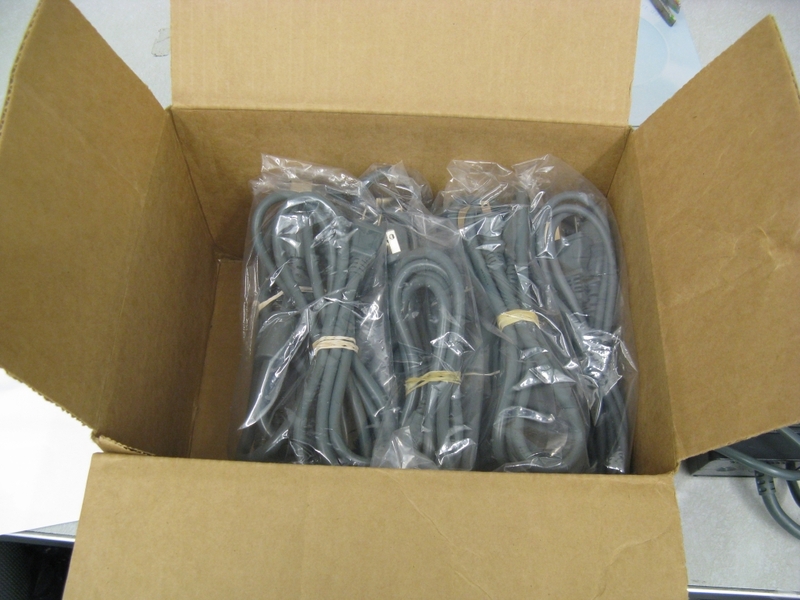 Open-loop back EMF or flux observers, which require a good motor model. Closed-loop back EMF or flux observers, which are more forgiving. There are at least two ways to detect the rotor position of a permanent magnet motor even at a standstill. If the rotor has saliency, its inductance is a function of electrical angle. Internal permanent magnet (IPM) motors are one good example of this, since the flux path through rotor steel changes as a function of angle. But surface permanent magnet (SPM) motors, like the ones I mostly encounter, have more-or-less constant inductance. The magnets themselves have close to the permeability of air, and the steel back-iron is rotationally symmetric. 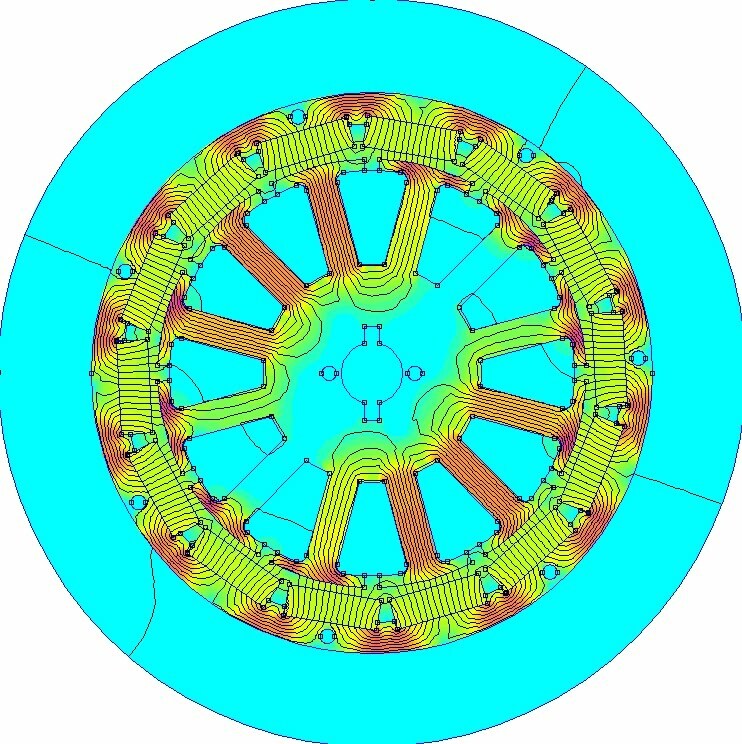 There's another way to statically determine the position of the rotor, which relies only on the fact that motors like this operate stator teeth very near to saturation. The flux density in the most "orange" teeth in the FEMM simulation above is about 1.8T. So, driving current into that tooth's winding would not be able to increase the flux as much in the positive direction as it would in the negative direction. (Also, the rise time would be faster in the positive direction.) 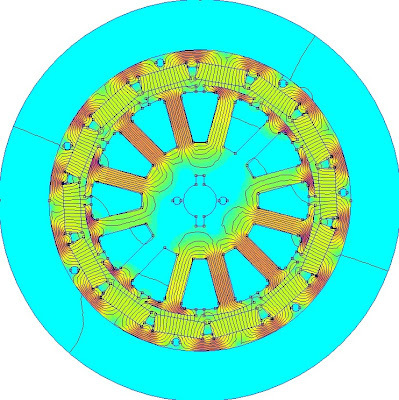 A clever algorithm could pick out the rotor position based on this principle. I don't really want to write a clever algorithm, though. Measuring inductance requires good high-bandwidth current sensing, which I don't currently have, to pick out the rise time in response to a voltage step. Also, this algorithm only applies to start-up unless you use high-frequency injection to measure inductance dynamically while the phases are being driven. I'm sure there are some magic ways to do this that are cleaner than I am imagining (Rainer Nase, I'm looking at you...), but right now it's not something I want to mess this. Moving on, then, to open-loop observers. An observer is a control structure that attempts to recreate states which are hidden from direct sensing. Generally, an observer requires some model of the plant, so a good place to start would be a model of a three-phase brushless motor. Engineers do it with models. The first maths is just stating KVL for the motor model. V and I can be measured directly, and presumably we know R and L for a given motor, so solving for back EMF, E, shouldn't be a problem. If we know the back EMF, then we know the position of the rotor. The second maths is an alternative open-loop observer on rotor flux linkage, which is just the integral of back EMF. This has some practical advantage over the first maths. 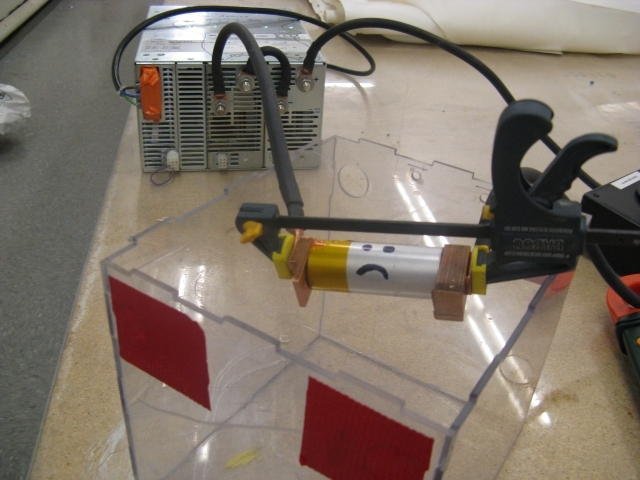 Taking the derivative of the already-noisy current measurement will result in bad things, so even though they are physically equivalent, the smoothing integral formulation of the flux observer is more appealing in a noisy environment. Since rotor flux lines up with the permanent magnets, this also gives rotor position. The closed-loop observers go one step further. Input the drive voltage, V, based on the PWM state. Estimate the current, i*, based on the motor model and back EMF estimate. Compare to the measured current, i. Feedback (i - i*) into the observer to modify the back EMF estimate. "Fake motor" exists only in software. This is less dependent on having perfectly accurate resistance and inductance parameters. The linear version of this, called a Luenberger observer, is detailed in Mevey, Chapter 7. Since I learned pretty much everything I know about brushless motor theory from Mevey's thesis, I would give a lot of weight to his particular explanation. There is also a slightly different feedback structure that I really like, called a sliding-mode observer. Instead of using the value of (i - i*), it uses only the sign of the error in what is aptly described as a Class D Error Amplifier, switching rapidly between a positive and a negative feedback path. The appeal of this method, covered well in Microchip AN1078, is that the switching structure clearly "eats" the current measurement noise. Right? ...... Right? Anyway the sliding mode observer structure from AN1078 is the one I am most interested in trying, since it might even work on my existing hardware, crappy current sensors and all. The only question remaining is exactly which current and back EMF are being observed. I can get the rotor angle the same way I do now. All I need are fake Hall effect sensors for my fake motor. Since I am observing back EMF or flux on each phase, I can easily (with if statements) detect zero crossings and flag a fake Hall effect sensor transition. This can then feed my existing controller, including the sine wave interpolation, with no modification at all. The rotor angle is calculated by the existing interpolation routine with no need for arctan. It's unconventional, which I like, but I really think it will work and it's simpler than what's out there. ...all the Nissan Leaves were spoken for, okay? Actually, I kinda liked it because you could clearly feel all the inner workings of the electric drive. 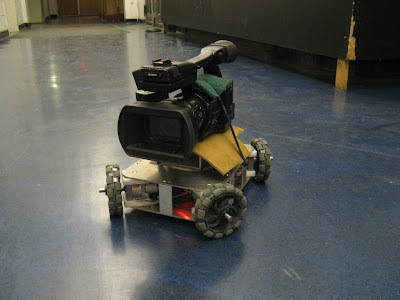 It reminded me of the Cap Kart...you had to press an LED-lit button with an arrow on it to choose forward or reverse, and it had the turning radius of a small truck. Not sure how well that bodes for commercialization, but it was fun in sport mode, anyway. Actually, we were there to present a paper on Miniature Electric Hub Motors, which if you're new to this game, is the key technology in Pneu Scooter, BWD, and about one third of the crazy things Charles builds. Generally speaking, the miniature hub motors are more of a fun hobby for us, but we really couldn't pass up this opportunity to disrupt the atmosphere of an academic conference with them. Yo, where can we park these? Oh right, I forgot to mention that we brought hardware. 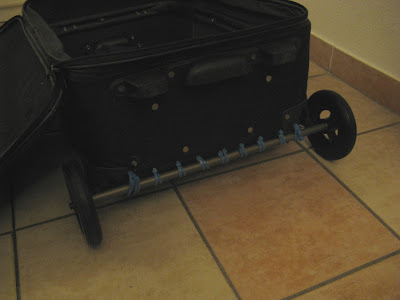 As it turns out, both Pneu Scooter and RazEr rEVolution fit well into checked air baggage. 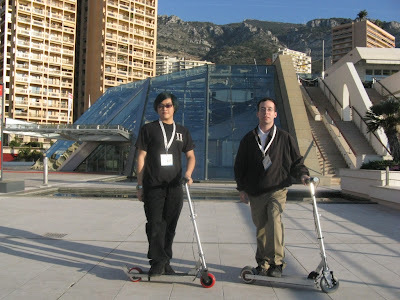 (I took Pneu Scooter to and from Singapore as I was completing it.) The only tricky part is the lithium batteries, but according to the TSA, one large (up to 300Wh) battery installed in a device is allowed in checked baggage. Pneu Scooter's battery clocks in at 145Wh, so I should be fine, right? ... Right? Overall, the presentation was well-received. The chair for our session was Professor Zhu, who is sort-of like a permanent magnet motor deity. In fact, at EVER '09, he delivered the keynote presentation on fractional-slot PM motors, which is exactly the type that we tend to use for the mini hub motors. Of course, then, one of our main goals was to get Prof. Zhu to test drive the scooters. ...which I'm not sure we were supposed to be allowed to do. Considering that the other entries all used pedal assist (and one had more than the nominal two wheels), and absolutely none of them fit in a suitcase, the mini hub motor scooters put up a good fight. I think most people were surprised; I don't know if that's because the scooters actually kept up with the e-bikes, or if it was because they had no idea where we came from or if we were even entered in the race. I'll post the on-board video when I get it (not my camera, obviously). So, the next step is to build a pan-tilt rig on top and then Surveillance Twitch will be complete...coming to an HVAC duct near you.